Chamber Music on the Hill, in residence at McDaniel College, presents “Going for Baroque,” an all Baroque concert featuring Nicholas Currie, violin; Rodrigo Tarraza, flute; Tim Anderson, cello; and Don Horneff, harpsichord on Sunday, November 11 at 3:00 p.m. The concert takes place in (Little) Baker Chapel. Canadian-born violinist Nicholas Currie is the assistant concertmaster of Concert Artists of Baltimore, assistant concertmaster of the Annapolis Symphony, and concertmaster of the Mid-Atlantic Symphony. Mr. Currie is a graduate of the Peabody Conservatory of Music in Baltimore, where he studied with the late Berl Senofsky. 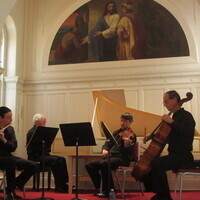 Nicholas also studied under the late Bernard Eichen, member of the Beaux Arts Quartet, at Illinois State University. Rodrigo Tarraza is an internationally renowned flautist and one of the few musicians worldwide specializing in baroque transverse flute. He studied with Barthold Kuijken at the Royal Conservatory, The Hague, and has performed throughout North America, South America and Europe as both a soloist and chamber musician. When he is not playing baroque flute, you might find Rodrigo playing the bansuri, or Indian flute, for which he studied with Hari Prasad Chaurasia. He also has played the flute, saxophone, and EWI (Electric Wind Instrument) in the internationally acclaimed jazz-fusion band, Unfulfilled Desires. Cellist Tim Anderson received a B.A. in Music Performance from the University of South Florida and studied at the graduate level at Peabody Conservatory and Syracuse University. He has performed in the Baltimore Opera, Delaware, Harrisburg, Syracuse, and Mexico City orchestras, among others. Other performances include music festivals in Los Angeles, Cleveland, Charleston, Vancouver, B.C., Quebec, and Graz, Austria. In a teaching capacity, Tim has been on the faculty of UMBC, and is presently cello instructor at McDaniel College and Harford Community College. He is music director of the Concord Ensemble, which appeared on the "Today Show" and in the movie "The Visiting". Tim is a member of the Lancaster Symphony and the Live Wire String Quartet. Don Horneff has been a member of the McDaniel College music faculty teaching piano lab, harpsichord, and electronic music, and serving as staff piano technician since 1991. He taught brass at the college for 15 years and was staff accompanist for 16 years. After receiving a B.S. degree in music education from Elizabethtown College, Don performed for 17 years extensively throughout the mid-Atlantic region in a variety of musical settings. He was a recording artist for PianoDisc and taught music in the Carroll County Public Schools. He operates a piano tuning and repair service, and is Director of Music/Organist at Emmanuel United Church of Christ in Hanover, PA. Don is on the Board of Directors of Chamber Music on the Hill.